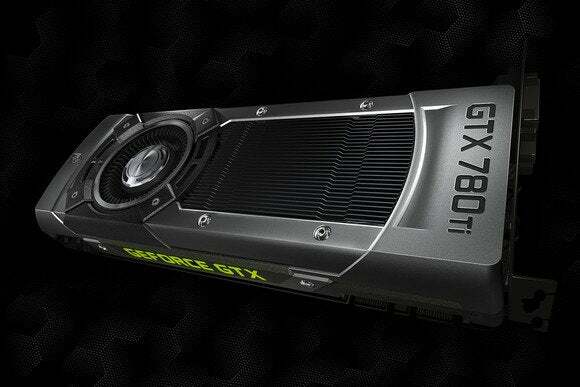 Move over, Radeon R9 290X: There’s a new graphics card champion in town. On Thursday, Nvidia finally took the wraps off the GeForce GTX 780 Ti, a $700 beast with the heart of a GTX Titan—but a much more palatable (though still enthusiast-only) price. The GTX 780 Ti isn’t a whole new breed of GPU; like the Titan, the GTX 780, and the GTX 770, it’s built from Nvidia’s high-end GK110 graphics processing unit, sporting an 875MHz core clock, 3GB of memory, and more ROPS, TMUs, and CUDA cores than you can shake a stick at. In fact, early reviews from AnandTech, Bit-Tech, Tom’s Hardware, and others show that the GTX 780 Ti outpaces all of AMD’s offerings as well as the legendary Titan—which now makes the Titan’s $1000 price point a particularly hard sell. Simply put, the GTX 780 Ti looks to be the face-meltingly fastest graphics card you can buy today (unless you start dabbling in dual-GPU solutions), and like its GK110-based brethren, the GTX 780 Ti also includes the three triple-A games that comprise Nvidia’s Holiday Gaming Bundle. No matter how you slice it, it’s a great time to be a gamer. Not only are AMD and Nvidia slugging it out from the high-end on down, but we’re on the cusp of a new generation of consoles, including Valve’s Steam Machines, which were designed to bring PC gaming to your living room. And once you’ve snagged your graphics card of choice, be sure to check out PCWorld’s games section for all the info you need about the software that makes your hardware hum oh-so-sweetly.